For his Mitzvah project, Logan chose The Lone Soldier Project, which aims to enable lone soldiers to share their voice with the world, support those in active duty, and utilize their leadership skills to continue making a difference for Israel after their army service has ended. 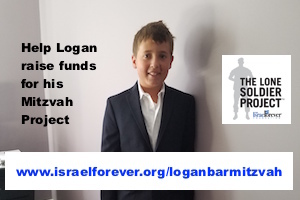 To read more about why Logan chose The Lone Soldier Project for his Mitzvah Project, click HERE. To learn more about The Lone Soldier Project, click HERE.